A court drawing showing the pirates and their defense lawyers in a Rotterdam courtroom on May 25, 2010. (CNN) -- Five Somali men were convicted of plotting a hijack at sea and sentenced to five years in prison in the Netherlands, in the first trial of pirates in Europe, a prosecution spokesman said Thursday. The court rejected their claim that they were innocent fishermen, said Wim de Bruin, a spokesman for Netherlands National Prosecutor's Office, noting that no fishing gear was found in their boat. The five were captured by the Danish navy in January 2009 in the Gulf of Aden, off Somalia, after a cargo ship with Dutch Antilles flag was attacked. "The ship of the pirates was destroyed by the Danish navy, and the pirates were captured and handed to the Dutch authorities," de Bruin said. They have two weeks to file an appeal, he said, adding that he did not know if they planned to fight their conviction. They had faced a maximum sentence of 9 to 12 years, he added. 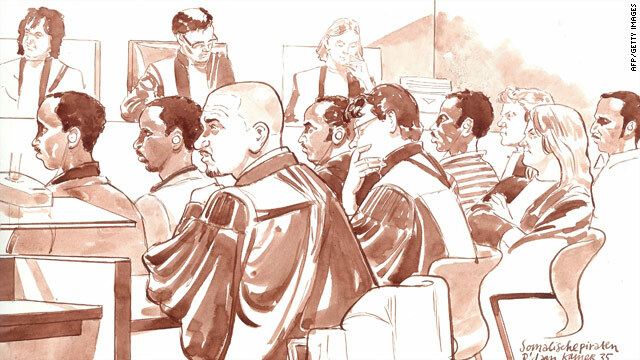 The trial of the five opened in Rotterdam District Court on May 25. Another suspected Somali pirate is awaiting sentencing in the United States, where he pleaded guilty in May to hijacking and kidnapping. He pleaded guilty May 19 in a New York federal court to felony counts of hijacking maritime vessels, kidnapping and hostage-taking for his role in the hijacking of the Maersk Alabama in the Indian Ocean on April 8, 2009. The pirates who were tried in the Netherlands spent four weeks aboard the Danish navy ship after their capture before being taken to the Netherlands, spokesman de Bruin said. Five Dutch defense lawyers represented the suspects, he said. The trial is the first of its kind in Europe, he said. They were arrested after their attempt to board a German cargo vessel, but the Danish navy ended the hijacking and handed them over to the Dutch authorities, Bruin said.